Because sometimes 140 characters are simply not enough. Light and Shadow, Part Two: How I Learned to Love Harry Truman and Hate the Bomb. Yesterday, I posted the first installment of an essay reflecting on a work of art I saw in 1973, and subsequently purchased in 1984—a Japanese woodblock print by Jun’ichiro Sekino, entitled Hara: Rooftop Reflections of Mt. Fuji. It will be helpful, though not absolutely necessary, to read part one first. The theme of part one is that God can and will speak to us authoritatively, in the time and place of his choosing, using anything he desires, including a work of art done by an artist who was most likely a Buddhist and whose work may reflect more than anything else the mindset of a culture seemingly more likely to bow the knee to the creation rather than to the Creator. In that encounter with the art, the artist, and the One who created the artist, I received a palpable sense of how art can be one of the highest expressions of what it means to be created in the image of God. It can be argued that we bear the image of God in our being and in our works even when we are unaware of it or when that is not our intent. Sadly, we bear something else in addition to the imago Dei, something dark and evil that rises all too often in an effort to turn the image of God in each of us upside down. For all the positive messages conveyed by Hara, there lurks a dark undertone that is an irreplaceable part of observable reality. Recognizing it is necessary to reveal what Alister McGrath calls the “deeper value and true significance” of the world. The print does not seem to directly speak of that darkness, but the overall dark grey tones of the piece remind me that for most of us the light is seen only in contrast to the dark. I am also reminded of that darkness each year in August on the anniversaries of the bombings of Hiroshima and Nagasaki, which occurred on August 6 and 9, 1945. It is not at all far-fetched that an image of Mt. Fuji, subtly portrayed, but leaving no doubt as to its physical majesty, could reveal and reflect the immanence of God, not just for those who live in its shadow, but also for me, someone whose only direct connections to Japanese culture are a Sony® television and the fact that my father was stationed on Okinawa in August of 1945 waiting to invade the Japanese main island. But like the upside down image of the mountain in Hara, my personal connection to Japan is defined by a disorienting reality. Had Harry Truman not dropped nuclear weapons on Hiroshima and Nagasaki, I might never have been born. The assault on Japan was expected to be far worse than the D-Day carnage at Normandy Beach. War planners’ conservative estimates projected that over a million American troops were likely to die in the battle for Japan, perhaps multiple millions among the Japanese. Those numbers are not unrealistic. Over 100,000 people died in the 82-day-long battle for Okinawa, the first island to fall. Given the front-line role my father would have played in the invasion as a sailor on a small craft that carried troops onto the beach, his life-expectancy in the battle probably would have been measured in seconds, not minutes, hours or days. Had the invasion occurred, at the very least I would have a different last name. The Germans attempted to build an atomic bomb and failed. 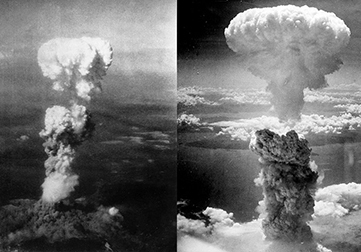 The United States, in an enormously expensive effort code named The Manhattan Project, successfully developed the capacity to “harness the basic power of the universe…” in order to loose it “…against those who brought war to the Far East.” Once testing confirmed that the bomb would perform as advertised, the Americans sought the unconditional surrender of Japan, which they rejected. There is much historical speculation about the ultimate motivations for using the atomic bomb, but politics notwithstanding, it was used—first on August 6, 1945 on the city of Hiroshima, and second on August 9, 1945 on the city of Nagasaki. It was seen as the most efficient means to accomplish the objective of ending the war, and likely was used for additional purposes, such as serving as a stern warning to a nascent Soviet expansionism. Japan formally surrendered on September 2, 1945. My father was still safely docked on Okinawa, 350 miles from the main island. It is one thing to thank God for the end of that war and for the grace that brought my father home before I was conceived. But the sobering reality is knowing that so many people died in those two Japanese cities. Estimates vary but the numbers are between 150,000 and 250,000. For those looking for even more religious irony, while both cities were active in producing materiel for the war effort, Nagasaki was probably the Japanese city with the largest Christian population, having been evangelized first in the 16th century by the Jesuits. Despite struggles over the centuries, a large underground church had flourished, and by the time of the bombing, the community was growing and healthy above ground. Unfortunately that meant above ground-zero. We try, vainly in my view, to justify the bomb using a familiar calculus in which “the needs of the many outweigh the needs of the few.” From that perspective you would try to say it is better that only a quarter million people died instead of the two million who would have perished in an invasion. In the 19th century, Jeremy Bentham and John Stuart Mill elevated that principle into the philosophy known as Utilitarianism. They argued that “the greatest happiness of the greatest number… is the measure of right and wrong.” Happiness is defined as pleasure, or the absence of pain. Unhappiness is pain. Increasing human happiness, or decreasing human unhappiness are both good. Increasing happiness for the most people in a given situation while attempting to minimize the unhappiness of others guides the proper decision-making process for the Utilitarian. We all want more people to be happy and fewer people to suffer, therefore: Invasion bad; bomb good. Sounds reasonable, right? Even logical. Utilitarianism may be about as close to Buddhism as a couple of Victorian Era, philosophically-inclined, British gentlemen could possibly get. Both practices seek to diminish suffering. Both place high value on ethical behavior. Significantly, both outlooks wind up diminishing, even negating, the importance of the self or the individual—for the Buddhist as a means to enlightenment, and for the Utilitarian as a logical consequence of a philosophy that ultimately advocates the principle that the needs of the many outweigh the needs of the few. I’m no expert in either Utilitarianism or in Buddhism, and bearing in mind how the main character in Robert Pirsig’s Zen and the Art of Motorcycle Maintenance was driven crazy through wrestling with some of these issues, I’ll leave more comparisons between the two philosophies to others. I will say, however, that there is some irony in the fact that Truman’s approach is similar to a principle that underlies the belief system of those who were killed and wounded in the bombings. There must be in that a hint of the universality of the fallen state of human nature. I am not especially critical of Truman’s decision, and not merely because I am alive, though I admit that is part of it. The truth is I shudder and imagine I would have made the same choice. There are unresolvable issues in this life, situations where every choice is a wrong choice. To rescue most of a group of hostages, some may die. It is a risk we train rescuers to take when negotiations fail. To save the most people injured in an accident, a battle, or a disaster, we perform triage, separating those who cannot be saved from those who can, in order to utilize limited resources more efficiently. We often describe those who must make those decisions as having moral courage and perhaps that is true of some. But the more likely case is that they are only playing what they believe to be the least destructive hand in a game where they are dealt no other cards. The choice to sacrifice the few for the good of the many is always an accommodation to the bitter reality that this is a fallen world and every last one of us is a part of that fallen order. In John 11:50, the High Priest, Caiaphas, attempts to justify the execution of Jesus by saying, “…it is expedient for us that one man should die for the people, and that the whole nation perish not.” The utilitarian logic here is inescapable. But we ought not believe that God’s reason for allowing Jesus to die for our sins was based in utility. As hard as it is for us to fathom, he sacrificed Jesus in the exact same way that God does everything he ever has done or ever will do, out of love, not in some desperate hope of making the best out of a bad situation. The idea of making the best out of a bad situation is our natural predicament. It is why we come up with things like Utilitarianism, or Buddhism, or “Galatianism,” or every other form of ethical and religious expression. Our ethics and our religions are, in the end, complete failures. As Isaiah put it, “all our righteous acts are like filthy rags.” (Isaiah 64:6) But underlying that effort is something worth thinking about. That we attempt to define good and evil at all is a tacit recognition that something called good and evil exists. Apart from the Fall, I suspect that even the idea of good and evil might have been entirely God’s domain. We would never have even had to think about it. But we do think about it. Our desire for the good informs everything we do, though we are mostly unaware of it and our evil desires interfere with it all. Still, desire for the good motivates us to build legal, ethical and religious systems because our hearts long for the good. We seek friendship and community and love out of the same desire. We build homes and buildings and create music and art because we long for the good. And when, in art, we recognize that universal longing, imperfectly presented though it may be, it moves us, occasionally with the intensity that Sekino’s woodblock print moved me. Art is truly an expression of our role in the universe as image-bearers of our Creator. In the darkness and the shadows of our art, as well as in the sin and darkness of our acts, the image of God is still visible, although in what artists call chiaroscuro, what St. Thomas Aquinas called the via negativa. When scripture tells us “we see as through a glass darkly” it is not unreasonable to ask what is it that darkened the glass? To me the answer is obvious. Our sin. We continue to contribute to the darkness on a daily basis. But in his mercy, God has given us longing. We long for the time, as in the first two chapters of the book of Genesis, when all was truly right with the universe. And we long for a new Genesis, the time when our encounter with good will once again be face-to-face, all-encompassing, and when all evil—including wars and the hideous weapons of war—will be nothing more than a passing and utterly alien memory, immediately dismissed. The Grace of A.D.D. : Reflections on a Dear Childhood Friend. Skeuomorphism. Why We Are Never Surprised When Wile E. Coyote Loses. God’s Good Order: The Cycle Will Be Broken, Bye and Bye. Light and Shadow, Part One: How A Japanese Wood Block Print Turned My Worldview Upside Down.